It's no secret that I've always hated superhero movies. I find them to be cliche, over the top, and so far from reality, that often time the stories are just the lowest form of Science Fiction. The only movies of the superhero genre that I've ever truly enjoyed are the recent Batman trilogy and some of the recent Marvel films. That being said, I hated the first Thor film, because it came directly from a comic book and lacked any kind of background story whatsoever. Thanks in part to the Avengers and the development of the Loki character, that all changes with the second film. The story isn't directly from a comic book, but rather based on one. In this film, the characters are more established and there is a lengthy background story that only enhances the film, and the series. In the second film, Thor is tasked with stopping a deadly weapon, possessed by an all but extinct species. This weapon has the power to destroy the entire universe and as always, the focal point is on Earth. Unable to stop the weapon and save his girlfriend at the same time, Thor turns to an unlikely source for help, his now imprisoned brother, Loki. Given the magnitude of the story and the power of the enemy, I'm a bit surprised that they didn't keep this film to be used as an Avengers sequel, as it has all the makings of an epic sequel. Chris Hemsworth reprises his role as Thor and this time he is beyond terrific. His role in the Avengers really enhanced the popularity of a character that most people were unfamiliar with, and the tremendous start to the film really set the framework for Hemsworth to take Thor to the next level. Even the supporting cast steps it up a notch as Natalie Portman is more used to the idea of a boyfriend from another world and being involved in things she couldn't possibly understand. Finally, Tom Hiddleston tops of the story, with his portrayal of Loki. I may be going out on a limb here, but I thought Hiddleston was even better in The Dark World than he was in The Avengers. Going into the Avengers, next to The Hulk, Thor was the weakest of the introduction films, and the least known and appreciated character. That all changed with the Avengers and in his second film, the Thor character steps up to a level that rivals even Iron Man. 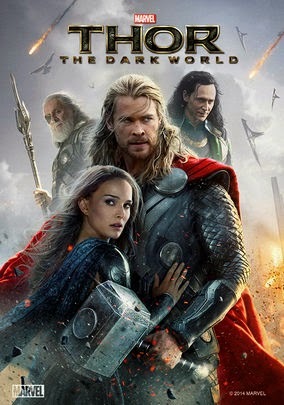 If you're not that into the series and have only selectively seen a few of the films, make sure you include the Dark World, as it is essential to fully understanding Thor and his impact in the future of the series.